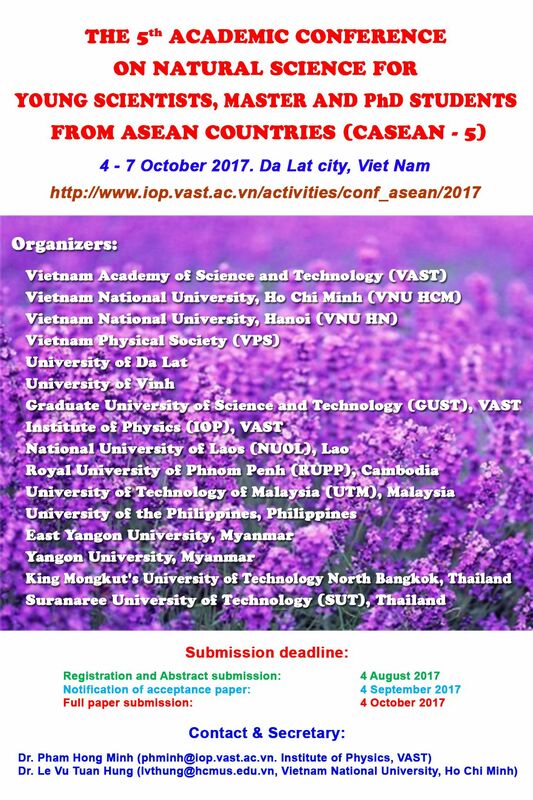 The 5th Academic Conference on Natural Science for Young Scientists, Master and PhD Students from Asean Countries (CASEAN - 5) will be held during October 4-7, 2017 at University of Dalat, Lam Dong, Viet Nam. The conference will cover the fields of natural sciences such as Mathematics, Physics, Chemistry, Biology, Materials Science, Medicine, Computer Science and Engineering... The main purpose of the Conference is to provide a good opportunity for young scientists, Master and PhD students coming from universities and institutes in ASEAN countries to develop regional exchange activities, mutual understanding and cooperation as well as stimulate scientific training and education. The papers presented at the conference will be selected, refereed and published in the CASEAN Proceedings (ISBN 978-604-913-088-5). Selected papers at CASEAN-5 can be further published in SCIE journal of Green Processing and Synthesis, after an appropriate peer reviewing.